Apparently February is National Sweet Potato Month! Who knew?! 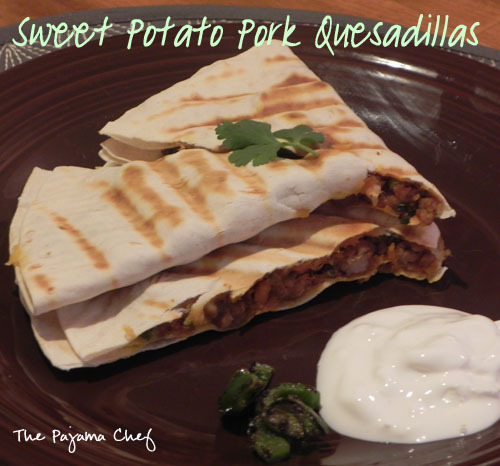 I know no better way to celebrate than with these awesome Sweet Potato Pork Quesadillas! Please forgive my less than stellar photos. I am so over this winter weather, it’s really killing my photos! But anyway–these quesadillas are ridiculously good. 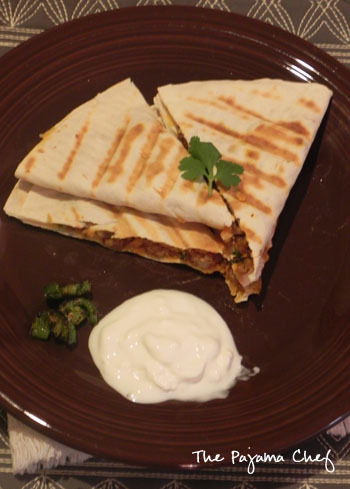 Though they require a few extra steps than a usual quesadilla, since you have to cook the ground pork and saute some jalapenos, they are well worth it! These quesadillas are the perfect combination of sweet and spicy goodness. We’ve made them for dinner a couple times, but I can definitely see them as a wonderful party appetizer too. As you can see, I served them with quite a bit of sour cream and some sauteed jalapenos. I hope you enjoy them as much as we do! Prick a medium sweet potato all over with a fork and microwave until soft, about 8-10 minutes. When sweet potato is cooked, let cool for a few minutes and then remove the skin. Gently mash sweet potato with a fork, then set aside. Meanwhile, heat a skillet over medium heat and cook pork with chili powder, breaking up with a wooden spoon until browned. Add garlic, green onions, and cooked sweet potato to skillet and stir together. Cook for a minute or so, then remove to a bowl. Stir in cilantro. Wipe out the skillet and add about 1 teaspoon of butter or oil to the skillet. After a minute or so, add tortilla to skillet. Evenly top tortilla with 1/2 cup cheese and 1/4 of the pork mixture. Reduce heat to low. After cheese is melted, fold the tortilla in half over the filling and cook until tortilla is golden brown. Remove from pan and cut into four wedges. Repeat to make an additional 3 quesadillas. Serve with a dollop of sour cream and a few slices of jalapenos, if desired. oh my gosh- my dad is ridiculous. i can’t wait for spring! Ooh, these sound fantastic! And they’d be delicious with leftover pulled pork instead of ground pork, too. I always wind up with tons of leftover pulled pork when I make it, so bookmarking this to use it up in the future! that’s an awesome idea, amy! i love it! i also wanna make them with chorizo one day. This is a month I can definitely get behind celebrating! What awesome quesadillas! These look yummy! I love quesadillas – they’re one of my staple Saturday lunches as they are so quick to do if you have the right ingredients in the fridge. I sometimes try and have leftover pork or chicken on a Saturday so I can make them. I love the healthy addition of the sweet potatoes in these ones. thank you, corina! i love the idea of trying a new kind of meat in them too. sweet potatoes are my favorite for sunday morning brunch. i usually have them for dinner but i’m sure they’re good anytime. Ooo I bet the sweet potatoes and pork pair so well together! 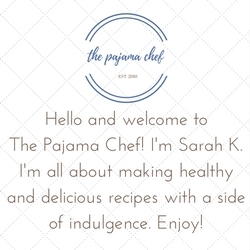 We love quesadillas at our house – there is something that is so comforting about them! yes, i agree! i could eat quesadillas multiple times a week! they’re great.